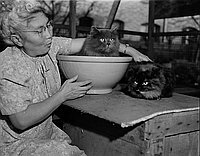 Older white-haired woman, Mrs. Sakai, with two long-haired cats outside, California, February 17, 1950. Wearing a dress and eyeglasses, Mrs. Sakai sits next to crate on which cats sit, sometimes in a white bowl. Typed on original negative envelope: Mrs. Sakai & Cats.